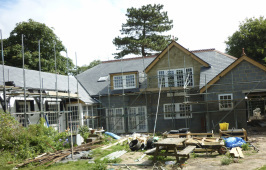 This project involved the complete modification and modernisation of a riverside home in Bourne End. It required partial demolition and reconstruction of the existing house, together with the conversion of a boat house. The existing house was demolished, leaving only the front wall standing. 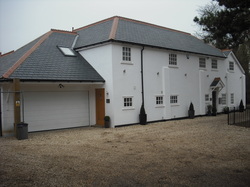 A new house was then built to support the original wall, giving a spacious and modern family home. The client specified a high level of insulation, complimented by extensive use of low-energy lighting throughout. This 4,000 square feet, 6 bedroom house now has similar energy requirements to a modern 3 bedroom semi. Much effort went into gaining a feeling of space and light with the installation of structural oak beams in the living room and master bedroom to give open vaulted celings. The large living space also benefits from a bespoke handmade kitchen and breakfast area with double doors leading to the garden. 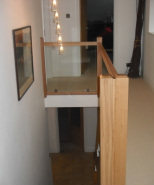 The house flows naturally up the stairs which are hand-made from oak and glass to maximise the light. 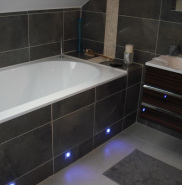 The client also specified the fitting of high-end custom designed bathrooms. The master bedroom also has an oak beamed vaulted ceiling and the theme of oak and glass is continued with the master bedroom balcony. We extended this house by 80% by adding a single storey kitchen extention to the back and a double story extention on the side which forms the sitting room and master bedroom. The kitchen transformed from a narrow 6' galley into a light and airy space. The sitting room was finished with oak floor-boards and the internal oak double doors were reclaimed from an old school. This large kitchen/dining area was the result when we knocked down an internal wall to create one large and open space. Built to the customer's specifications from natural materials to suit its woodland surroundings, this building provides garaging and a workshop to restore vintage vehicles.